Den Haag Centraal (Dutch pronunciation: [dɛn ˌɦaːx sɛnˈtraːl]; English: The Hague Central) is the largest railway station in the city of The Hague, and with twelve tracks, the largest terminal station in the Netherlands. The station was completed in 1973, adjacent to its predecessor: station Den Haag Staatsspoor, which was subsequently demolished. 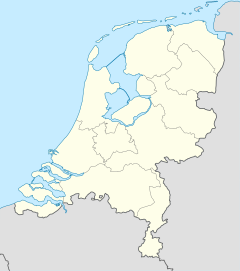 It is the western terminus of the Gouda–Den Haag railway. The oldest station in The Hague is Den Haag Hollands Spoor (The Hague Holland's Rail) on the main line from Amsterdam to Rotterdam, opened in 1843 by the Hollandsche IJzeren Spoorweg-Maatschappij (Holland's Iron Railroad Company). This station was built at some distance from the city centre. In 1870, the Nederlandsche Rhijnspoorweg-Maatschappij (Dutch Rhine-railroad Company) opened a second station in The Hague, Den Haag Rijnspoor (The Hague Rhine Rail) for trains to Gouda and Utrecht. This station was built much closer to the city centre. From 1888 this railroad was the property of the Maatschappij tot Exploitatie van Staatsspoorwegen (State Railway Operation Company); the station was renamed Den Haag Staatsspoor ("The Hague State Rail"). In the 1970s, Nederlandse Spoorwegen decided to build a new Central Station in The Hague and it was decided to build the new station next to Staatsspoor station. The old station was demolished after the new station was completed. A chord was also built to connect the station to the line to Amsterdam. Although Centraal station is the largest station in The Hague, it is served only by terminating trains; Intercity and international trains travelling between Amsterdam and Rotterdam stop only at Hollands Spoor station. Now, The Hague is the only city in the Netherlands which still has two major railway stations. There are 22 scheduled trains per hour that leave Den Haag Centraal on a normal weekday (07:00 - 20:00). Sprinter services call at every station along the way whilst Intercity trains only stop at the major stations. 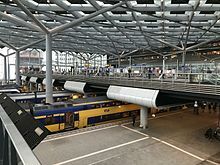 There are 6 trains an hour (each way) connecting Den Haag Centraal with Rotterdam Centraal, 6 train an hour connecting it with Utrecht and 4 with Amsterdam. Den Haag Centraal is a public transportation hub and a major nodal hub for the tram network run by HTM Personenvervoer. The railway station features two separate sets of platforms. These are two elevated island platforms serving four tracks, located above and lying perpendicular to the heavy rail tracks, serving lines 2, 3, 4, and 6. Regular lines 2 and 6 use the inner tracks, while the RandstadRail lines 3 and 4 use the outer tracks. They connect directly to the city centre tunnel to the west and the elevated tracks to Ternoot and Beatrixkwartier to the east. These are two ground-level side platforms and one island platform between them, located parallel to the heavy rail tracks outside the south-western entrance. All other city tram lines that call at the station use these platforms. The Rotterdam-based RET operates RandstadRail line E, a high-capacity metro service via Leidschenveen and Pijnacker to Rotterdam Centraal station. From there it shares track with line D of the Rotterdam Metro and terminates at Slinge station. Until August 2016, these services used platforms 11 and 12 of the mainline station, alongside the heavy rail tracks. Since then, two dedicated elevated platforms have come into use. Here, metro trains use the high-level side platforms; the low-level island platform is used by RandstadRail trams in case of emergency, when the connecting tracks via Beatrixkwartier cannot be used. There is a bus platform above the rail roads, which is connected to the Prins Bernhardviaduct running over the tracks. The platform is accessible from the station's main hall. Several city and regional lines of three different carriers stop here. HTM's bus lines starting with an N are night buses and only run on Fridays and Saturdays. Wikimedia Commons has media related to Den Haag Central station.